Rising water and electricity demands, and threats of greater flow variability due to climate change, continue to heighten appreciation that water is a scarce and valuable resource, and it is vital that water resource, water and electricity supply systems are operated as efficiently as possible. Benefits from the conjunctive use of water sources, and different forms of electricity generation, have led to the development of a range of computer programs for simulating and optimising system operation over both long and short time scales. However, computational constraints have often dictated that significant simplifications have had to be made when simulating and optimising operating policies designed to minimise costs while satisfying a wide range of physical, regulatory and supply reliability constraints. Continuing advances in computer technology now make it feasible to create generalised software which eliminate the need for many such simplifications, enable models to be rapidly constructed and modified, whilst providing greater transparency of the decision making processes involved. Program AQUARIUS exploits such advances and provide users with robust methods for optimising the operation of integrated water and electricity supply systems of considerable size and complexity, coupled with extensive tools for the seamless display and analysis of results. a generalised package capable of analysing systems of considerable size and complexity, with applications ranging from the optimisation of short-term and long term operation, through to development planning and commercial contract evaluations. increased expectations with respect to the 'user friendliness' and robustness of 'technical' software. Simulations can thus be carried out at with a level of detail appropriate to the available data and application objectives, while the long-term optimisation methodology ensures that the resulting operating policies are 'practical' in terms of complying with physical and regulatory constraints on system operation. Use of a variable dimensioning system enables computer memory requirements to be tailored to the size of the system being modelled, and effectively removing limits on the number of components that can be accommodated. The screen which allows such limits to be set is shown in Figure 2. AQUARIUS enables the 'on-screen' construction of a simulation model for a given water resource, water supply and electricity supply system. The user selects, from a menu, the component type to be added to the current diagram and positions the component by 'clicking' the mouse. AQUARIUS currently allows the user to select from the following Component Types. Reservoirs, Flow Points, River Reaches, River Abstractions, Pumping Stations, Transfer Aqueducts, Supply Aqueducts, Sewers, Water Sources, Treatment Works and Water Demand Areas. Hydroelectric Plants, Thermal Plants, Wind Power Plants, Pumped Storage Units, Transmission Lines, Transmission Nodes, and Electricity Demand Areas. 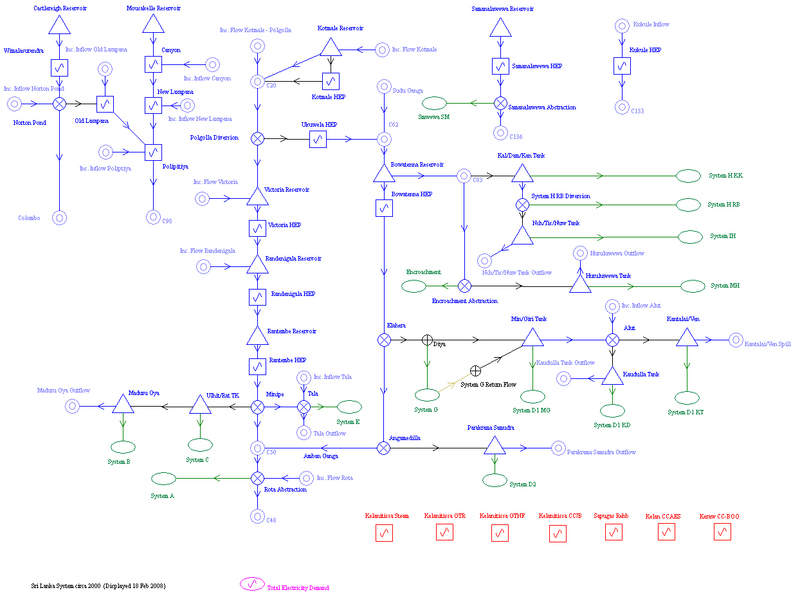 Transmission lines, transfer aqueducts, supply aqueducts, sewers and river reaches are 'connected' to appropriate component types by clicking the mouse on the 'from' component, and then dragging the cursor to the 'to' component and clicking again. Built in logic restricts the Component Types that can be connected; for example, transmission lines can only go 'from' a hydro, thermal or wind power plant 'to' a transmission node or electricity demand area, 'from' a transmission node 'to' another transmission node or electricity demand area, or between two electricity demand areas. The position of individual symbols and their names can be adjusted using 'drag and drop' to make the diagram visually acceptable and reflect topographic relationships, and the size of individual symbols independently set to reflect their relative importance. A specimen model diagram, created using AQUARIUS is reproduced as Figure 1 at hte top of this description. Except for stream flow, wind speed and demand time series, all input data to AQUARIUS is entered via a collection of 'on-screen' templates which vary with Component Type. These enable both initial data entry and the modification of existing values. The appropriate template is accessed by 'right-clicking' a component on the model diagram. The user can assign any name to a given component and, by 'right clicking' the name field, add a description that forms part of its data set. An example of the screen used for entering physical reservoir data is shown as Figure 3. 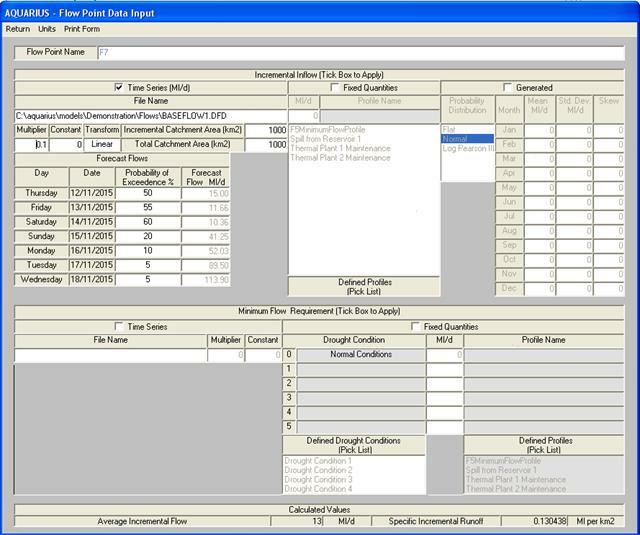 The input data screen used to set the last three data types is illustrated in Figure5 below. operating rules, based on the time of year and current content of individual reservoir or a group of reservoirs, specifying maximum and minimum reservoir takes, river and water source abstractions, pumping station operation or Stored Water Values. Electricity Demand Centres - the load (MW) to be supplied in each load block, as either daily quantities subject to a seasonal profile or as given by a time series. In addition to the model parameters described above, AQUARIUS allows for the entry and storage of additional information relating to each individual component and, in the case of hydro plants, turbine unit data. Daily time series of electricity demands, water demands, wind speeds and stream flows are input to the model from individual disc files, the names of which are user defined as part of the model data. The water volume unit used internally by AQUARIUS is the Megalitre (Ml), with flow rates in Ml per day (Ml/d). However, water related data can optionally be displayed and edited in Cubic Metre units i.e. with volumes in million cubic metres (Mm3) and flows in m3/s. The power unit used is the Megawatt (MW), and the energy unit is the MegaWatthour (MWh). With the exception of individual time series data files, all information relating to a particular AQUARIUS Model is stored in a single comma delimited disk file, and automatically assigned the attribute *.mdl. Any changes made to an existing Model, including those simply data related, can be saved under a different file name for later retrieva. 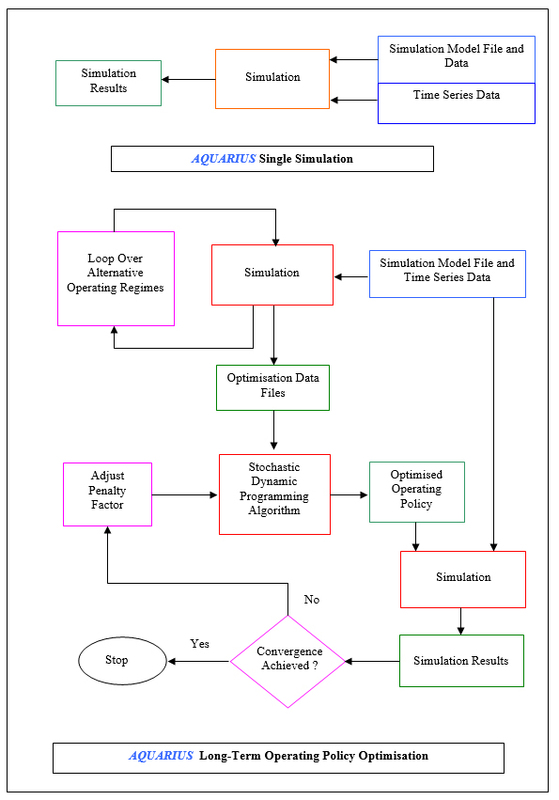 The steps performed during an AQUARIUS simulation are shown in flowchart form as Figure 6. The duration of each load block is defined on a system basis with the total duration summing to 24 hours. For each time step, AQUARIUS minimises the net cost of satisfying any imposed electricity and water demands using PWSC's proprietary LP solution algorithm. The LP input matrix is automatically constructed on the basis of the specified model components and topography (linkages), and the associated physical and economic data, including imposed constraints. To avoid the occurrence of 'infeasible solutions', all electricity and water demands, including minimum river flows, reservoir compensation releases and maximum ramping rates, are subject to user specified penalty costs which are applied in the case that a demand or requirement cannot be satisfied. Unit benefit costs can be assigned to electricity supplies (by load block), water supplies, reservoir compensation and minimum flow satisfaction. These costs can be used for allocating supplies of energy or water between different demand centres in times of unavoidable shortage. They also enable AQUARIUS to be used for Energy Trading analysis and optimisation. When formulating the resource/allocation problem, AQUARIUS automatically takes account of all component related constraints specified by the user e.g. 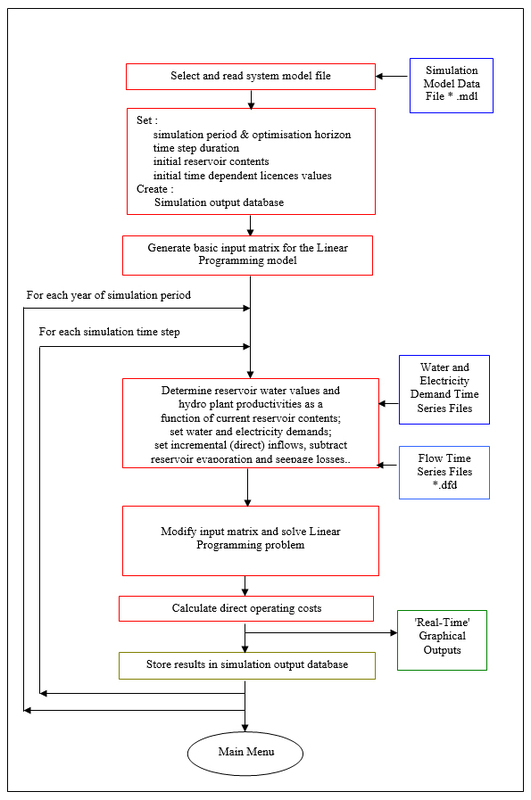 maximum and minimum throughputs, time and flow related licences, etc. However, it is recognised that there will often be other operational constraints which need to be respected e.g. raw water blending limits. Accordingly, AQUARIUS includes a generalised facility which allows the user to define additional constraints, based on a linear combination of any component variables employed within the LP model. These additional constraints can take the form of <=, = or >= expressions, and they are defined via a data input screen which provides the user with a 'pick list' of all available component variables and text boxes for entering the appropriate multiplying coefficients. To reduce execution times, the basic input matrix is created for the first simulation time step and only those elements which change between time steps are modified. For similar reasons, the maximum dimensions used by AQUARIUS e.g. the maximum number of reservoirs or transmission lines etc., can be adjusted by the user so as to minimise computer memory requirements. Within the LP formulation, reservoir releases can be assigned costs in accordance with input (long-term) Stored Water Values as a function of month and reservoir content, and such releases are optimised taking account of (downstream) incremental inflows within the river system. 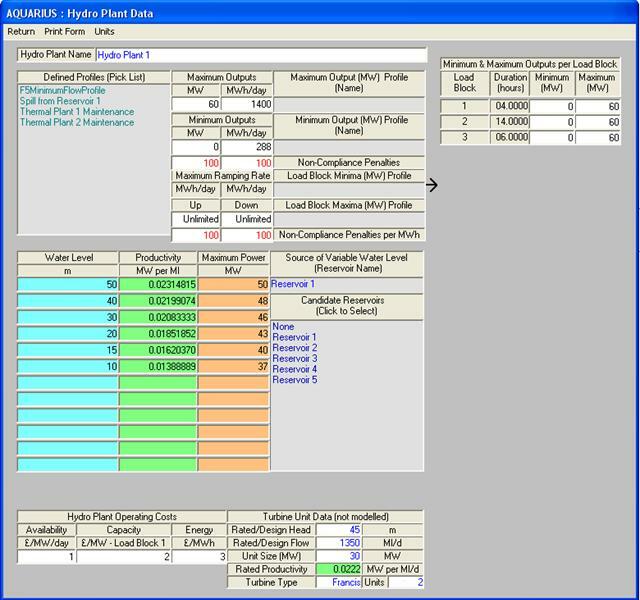 Hydro plant capacities are calculated as a function of the available flow and a MW per m3/s conversion factor. This productivity can be fixed or given as a function of flow and available generating head, while the latter may in turn be defined as being dependent on a specified upstream reservoir level. The following different types of simulation can be performed using AQUARIUS. Multi-Model : sequential simulations using up to 3 AQUARIUS models, with the start-of-year reservoir contents for models 2 & 3 set equal to the end-of-year contents obtained from running the previous model. In this way studies can be made of likely system performance over 3-year sequences from within the historic record, taking account of any data changes between models e.g. system configuration, demands, operating policies, costs etc. River Abstractions, Pumping Stations and Treatment Works : the throughput in Ml/d. At the start of each AQUARIUS run a modelname.log file is created to which run details and summary results are written. The dates and quantities of any water or electricity supply shortages and failures to meet compensation or minimum flow requirements are also recorded. 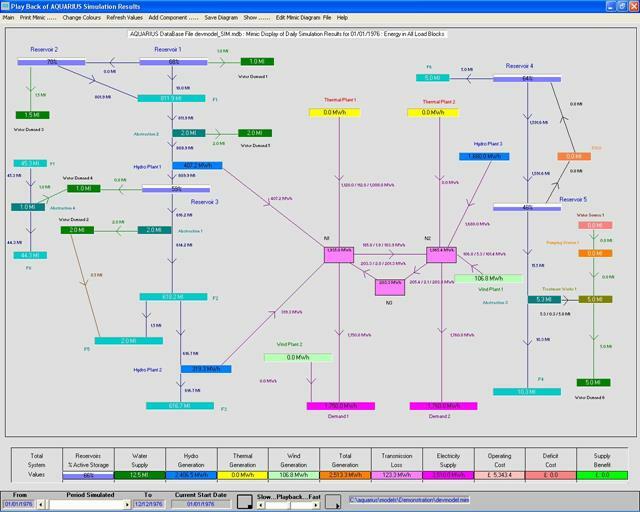 For each time step of the simulation, information on the inputs, outputs and performance of each component included in an AQUARIUS model, and for the overall system, are stored in a model specific Microsoft ACCESS© 2000 format database. Tables are also included for Drought Conditions and Time Dependent Licences. A new database 'modelname_SIM.mdb' is created at the start of a simulation, and summary records automatically produced showing average values for the simulated period. 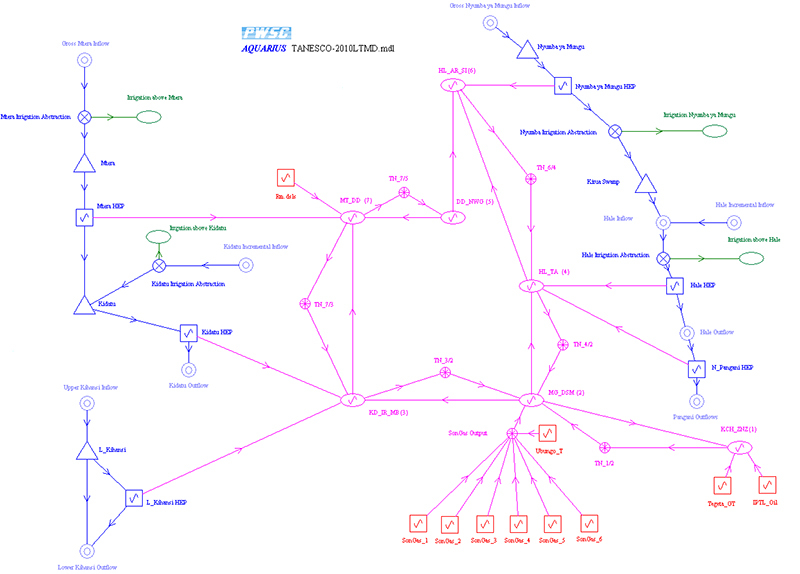 All database items can be viewed directly from AQUARIUS, with an example being shown as Figure 8. Any combination of time series values stored in the database can be plotted and viewed on screen, or printed with high definition. 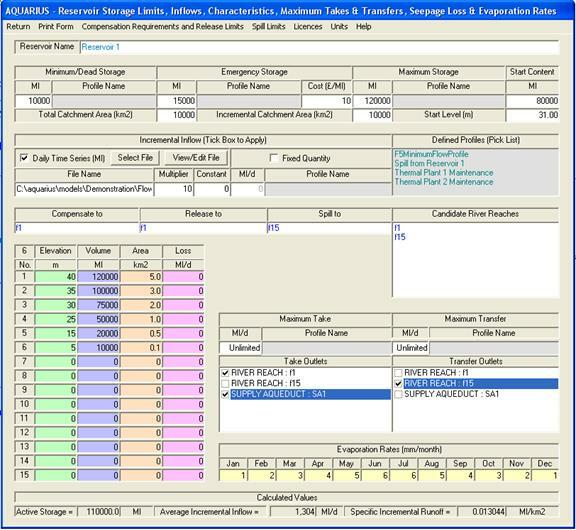 Values are automatically summed to provide weekly, monthly or annual time series, and averaged over the total simulation period. Line graphs (Figures 9 & 10), vertical bar charts, area graphs, or pie charts can be produced. The user is able to 'scroll through' values over the simulated period, and a 'hot hit' facility is included so that any plot point can be identified in terms of the component name and associated value. The Graphics Server© facility employed gives the user control over the content and appearance of any graph so that they can be tailored for inclusion in reports. Graphs can be output to disk file in 'bmp', 'jpg' or 'wmf' formats. It is often instructive to study and display system operation with a spatial perspective, and AQUARIUS provides facilities for this using so-called 'mimic' diagrams. 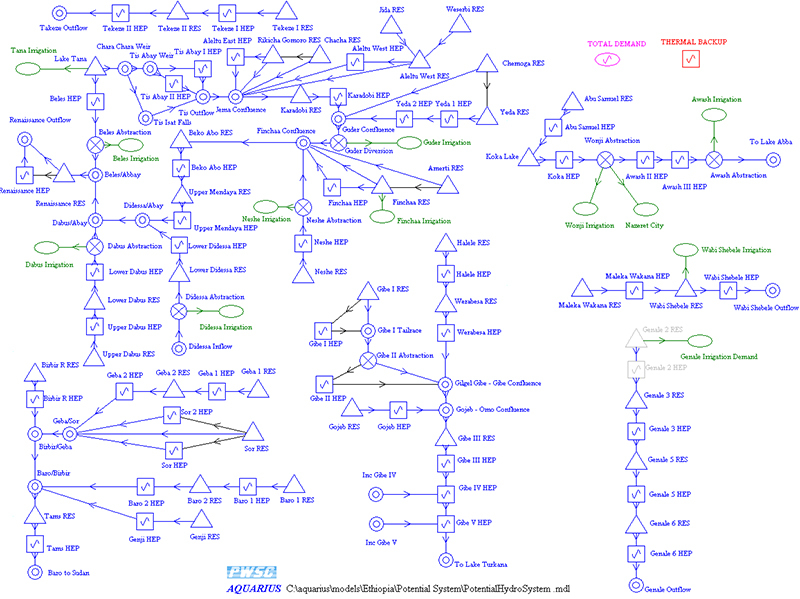 Such diagrams can be constructed directly and interactively based on information contained in the model file, and the display location of each model component can be adjusted using 'drag and drop'. Location, size, colour and other information is stored in *.MIM files for future retrieval. 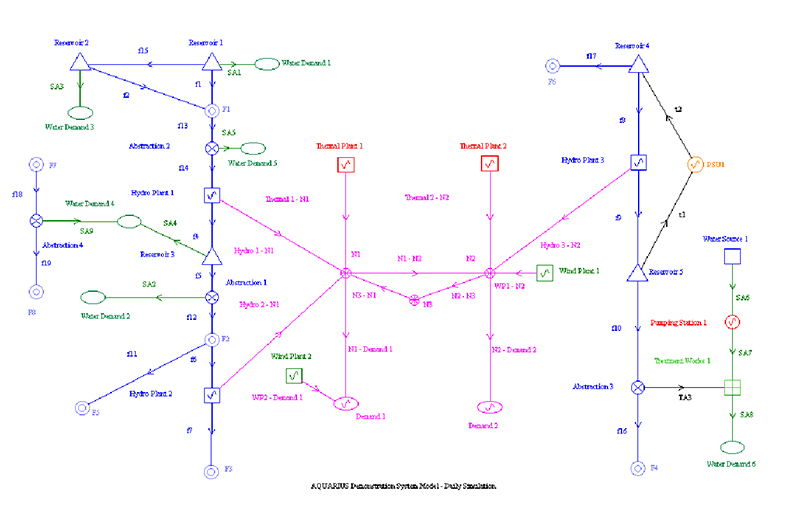 Mimic diagrams can be used to display a wide range of values recorded in the simulation results database. For example, reservoir values that can be shown include: average % active storage to date, average content to date, compensation release, end content, end % active storage, evaporation, minimum % active storage to date, minimum storage to date and spill. Marginal costs can be shown at water and electricity demands and at junction points and transmission nodes. Flows in Ml/d or m3/s through individual aqueducts and river reaches can be shown, together with any losses. For power plants, transmission lines and transmission nodes, energy flows in GWh or power flows in MW in each load block can be displayed. Total system values are automatically shown below the main diagram, as illustrated in Figure 11 below. Values corresponding to each simulation time-step can be displayed, as well as average values for the simulated period. The former facility can be particularly helpful when developing and authenticating new AQUARIUS models, while the latter can be used to provide high definition graphical outputs for inclusion in reports. When modelling power supply systems, it is often instructive to inspect the way in which each individual generation plant is dispatched in order to meet the electricity demands imposed. 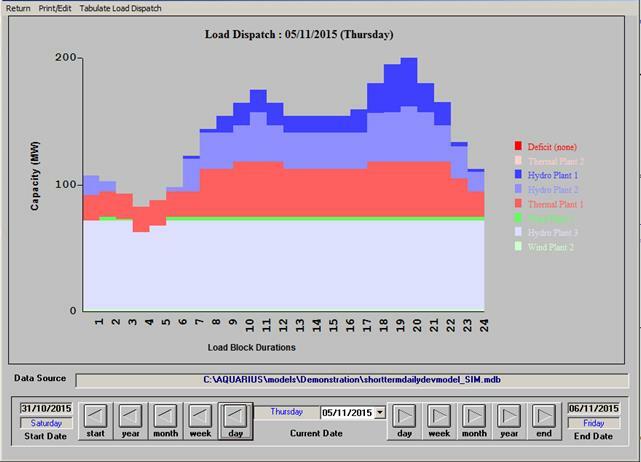 AQUARIUS therefore includes a facility to graphically display the output from each hydro, thermal and wind power plant in each load block for any simulation time step. As shown in Figure 12, a 'step through' facility is provided which enables the user to rapidly locate a time step of particular interest and, as with all graphical outputs, high definition printer output can be produced. The outputs from each generation plant in each load block can also be output in tabular form, so as to provide a generation schedule. 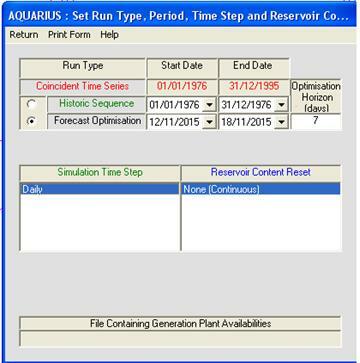 Figure 13 is an example of the daily schedule produced using the optional AQUARIUS Forecast Optimisation facility. This information can also be output to a specified *.CSV file. 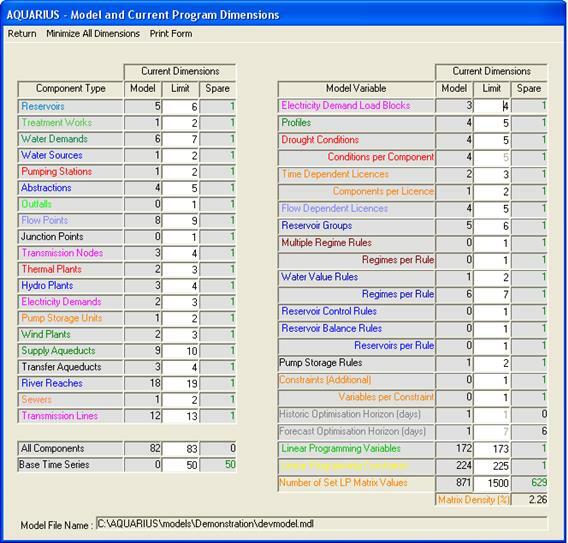 A summary of simulation results can be produced in the form of tables for selected component types. As illustrated below, such tables are generated for Reservoirs, water Demands, Hydro Plants, Thermal Plants, Wind Plants, Transmission Lines and Electricity Demands. 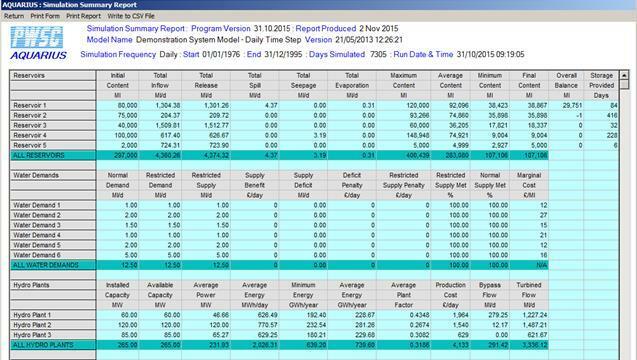 As shown in Figure 15 below, tables can be produced showing the average calendar monthly quantities associated with selected simulation outputs as a function of annual system inflows. Up to five annual inflow categories can be specified e.g. Very Dry, Dry, Average, Wet and Very Wet. Planners and regulators frequently request an assessment of the maximum water or electricity supplies that can be met by a system, based on given flow sequences and specified supply reliability criteria. For water resource/supply systems such estimates are sometimes referred to as 'firm yields' or 'deployable outputs'. For hydro-thermal power generation systems they are analogous to a 'firm energy' assessment. AQUARIUS incorporates a search procedure for identifying the demand multiplier consistent with satisfying such criteria, and also permits the user to select which individual water and electricity demands are to be subject to the multiplier. A key attribute of the approach is that the assessment can take into account any of the constraints on system operation incorporated within the AQUARIUS simulation model, including those used to define supply reliability. Within each AQUARIUS simulation time step, the quantity of water to be released from a reservoir can take account of one or more of the following types of operating rule. 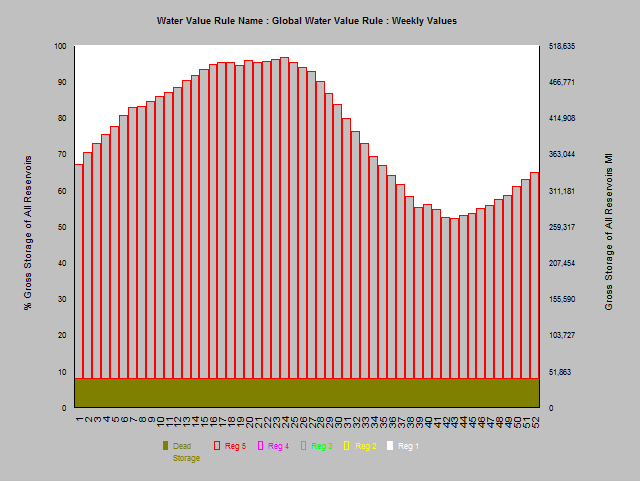 water value rules which, based on the contents of an individual or group of reservoirs included in the model, specify the value of stored water. For all such rules the critical reservoir contents can be expressed in terms of weekly or monthly values and, if required, be subject to linear interpolation. The frequency of inspection can also be set to daily, weekly or monthly, so as to reflect operational practicalities. AQUARIUS enables each type of rule to be optimised with PWSC's proprietary Policy Iteration Stochastic Dynamic Programming (DP) algorithm, which has been used to optimise the long-term operation of major hydro-thermal power generation systems1 and for optimising operation of the largest and most complex water resource/supply system in the UK2. Figure 16 shows the way in which this algorithm is used in conjunction with the simulation module. 2. Walker S., Walsh P.D. & Wyatt T. ' Derivation and Application of Medium-Term Operating Policies for the Northern Command Zone System of North West Water (UK) IAHS Baltimore Symposium, May 1989. 3. Wyatt T. 'An Integrated Simulation and Dynamic Programming Approach for Evaluating the Performance of Complex Water Resource Systems and Optimising Operating Policies: Methodology and Applications' IAHR International Workshop on "Drinking Water Systems Characterised by Different Sources : Design, Management and Monitoring of Quality of Supplied Waters". Turin, Italy, September 1996. 4. 'Reservoir Operation - The Case for Water Value Based Policies' "Circulation" - Newsletter of the British Hydrological Society - No. 94, August 2007. AQUARIUS also includes a Direct Search procedure which can be used to determine the relative position of fixed profile rules consistent with their satisfying user defined supply reliability criteria. 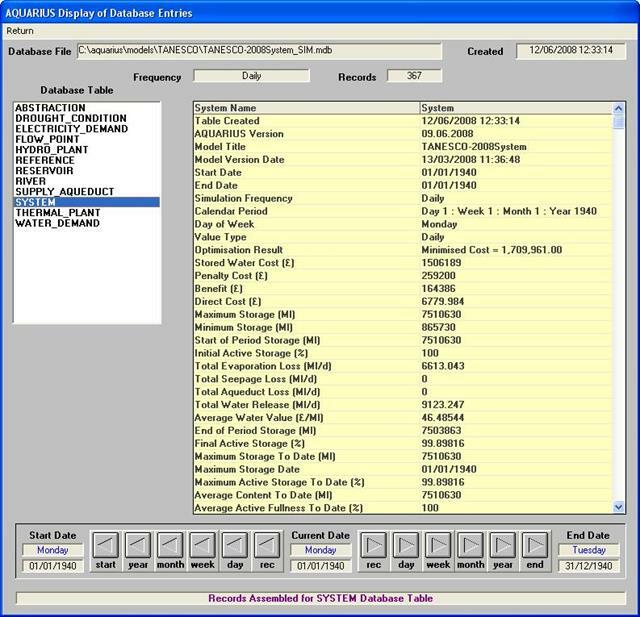 Operating policy optimisation data and results are stored in a Microsoft ACCESS© 2000 format database, which is automatically assigned the file name modelname_OPT.MDB. Contents of this database can be inspected using the facility illustrated in Figure 4. Application of this fully integrated simulation/optimisation technique is designed to provide practical operating policies and has been shown to give potential savings of more than 10% of average long-term operating costs when compared with more conventional methods of operation2. Stored Water Value rules can be particularly effective for balancing releases in multiple reservoir systems, while providing the type of information often required by short-term optimisation models. 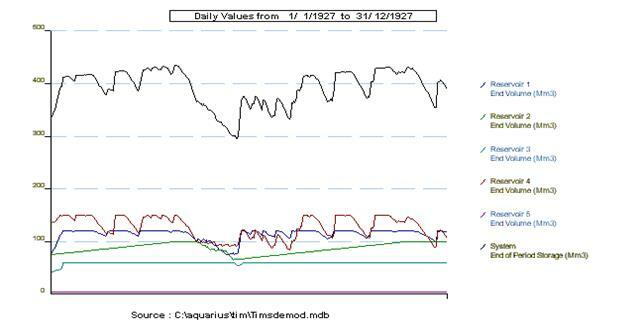 An example of a two regime weekly Water Value rule optimised using the AQUARIUS Stochastic Dynamic Programming algorithm is shown as Figure 17 below. AQUARIUS can provide optimised generation schedules for up to 7 days ahead, based on current reservoir contents, component availabilities, forecast water and electricity demands, inflows and, where appropriate, wind speeds. As shown in Figure 18 below, this module is specified from the Set Time etc. menu, together with the optimisation horizon in days. It can be noted that the time step is fixed to be daily, that the reservoir contents are not reset and that there is provision for generating plant availabilities to be input from a suitably formatted file. The maximum time horizon of 7 days allows account to be taken of weekly demand cycles i.e. to enable the refilling of reservoirs with weekly storage capability during weekends. It is also judged to represent current limits of inflow forecasting accuracy. Current reservoir contents using the screen for entering Physical Reservoir Characteristics, an example of which is shown in Figure 3. If volume/level data is provided for the reservoir, current levels can be entered which are automatically converted to volumes. 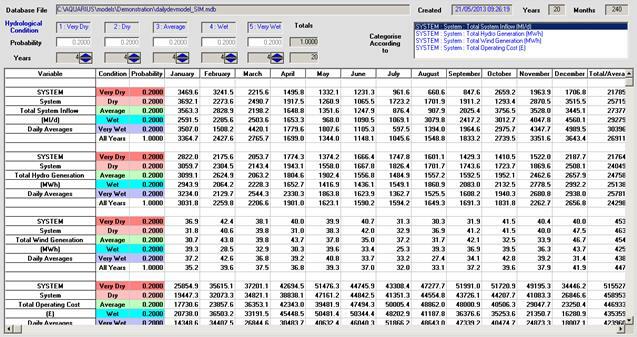 Component availabilities can be specified using their individual data input screens and appropriate seasonal profiles. Forecast water and electricity demands are input by way of their associated input screens and, in the case of the latter, by day and load block. As illustrated in Figure 19 below, inflow forecasts are input via Flow Point data screens. As well as enabling the direct input of forecast flows in Ml/d or m3/s units, if there is an associated time series file then it is possible to select for each day a 'Probability of Exceedence' and the corresponding flow is computed and appears in the appropriate field. This screen also shows that AQUARIUS has inbuilt facilities for generating synthetic flows based on given calendar monthly values of Mean, Standard Deviation and Skew according to the Normal or Log Pearson IIII distributions. Such facilities are incorporated to enable the program to be used with systems having limited historic hydrological records. All code, including that associated with the proprietary Linear and Dynamic Programming algorithms, has been written by PWSC, thus eliminating reliance on any third-party suppliers. the simulation time step specified i.e. daily, weekly or calendar monthly. In practice the level of detail used for a particular simulation will vary with the application. Thus, for planning studies it is usually sufficient to employ three load blocks representing peak, mid-range and base load conditions, whereas for optimising 'day or week ahead' system operation the use of 12 or even 24 load blocks might be appropriate. 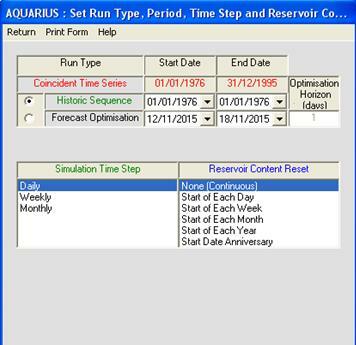 AQUARIUS allows the use of daily, weekly or monthly time steps, and the sensitivity of the simulation results to the time interval employed can therefore be readily quantified. Hence, while single simulations might be made with a daily time step, it may be acceptable if those made as part of a Yield Search or Long-term Operating Policy Optimisation process employ a weekly or even monthly interval. When optimising long-term operating policies a further determinant of execution time is the number of alternative operating regimes used when producing the input data for the optimisation process, since a separate simulation is performed for each. AQUARIUS is equally applicable to planning studies as for use in optimising long and short term operation. Uses might therefore include. 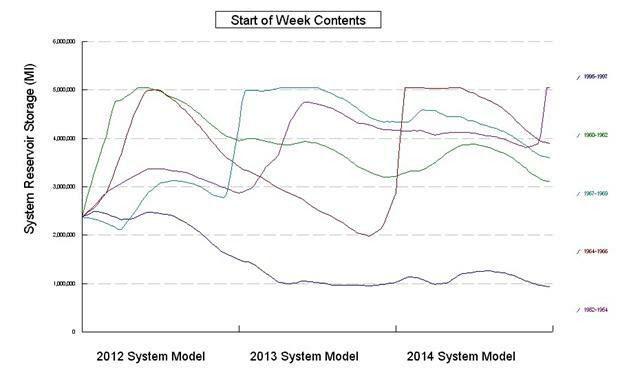 Least-cost optimisation of short-term (weekly) system operation based on current reservoir storage levels, forecast demands, component availabilities, wind speeds and inflows. In June 2009 AQUARIUS was installed in the offices of TANESCO in Dar es Salaam, and staff trained in its usage. In May 2013 AQUARIUS was installed in Addis Ababa as part of a Master Plan Study covering expansion of the Ethiopian generation and transmission systems until 2037, and staff of the national electricity authority, EEPCO, instructed in its application. AQUARIUS is available for outright purchase by individual utilities. Usage by consultants and international agencies, on a project-by-project basis, is by negotiation. It is recognised that the potential benefits that can be obtained from AQUARIUS can be difficult to quantify in advance of its application to a particular system. For example, the scope for optimisation may be limited by there being only a small difference between the current demand and maximum yield levels. Similarly, existing operating policies may already be close to optimal. Accordingly, it may be possible to negotiate a purchase price which is a proportion of the potential annual cost savings, based on the results obtained from an agreed AQUARIUS model representation and existing long-term operating policies. For further details on AQUARIUS and EPSIM, for optimising the development of integrated power supply systems, please contact us.